The Knitting Pirate » In Which the Pirate Compares Colours. « In Which the Pirate Arrrr-gyles. In Which the Pirate Compares Colours. Every so often I take a look at Blue Moon Fiber Arts to see if they've added anything new, or if anything jumps out at me. I really love the Socks that Rock yarn and invariably I find one or two (or five) colourways that I really want. Then I go check out the projects on Ravelry that were made in that colourway and wow, I am amazed at the differences. Monsoon, for example. 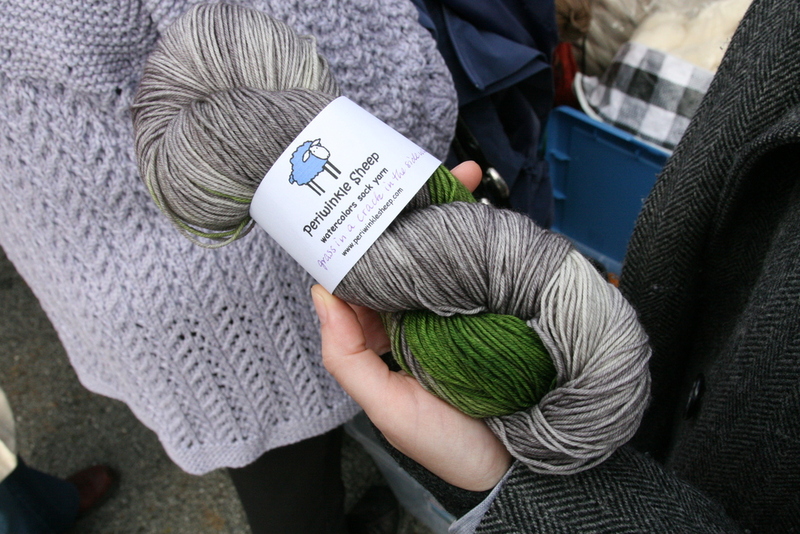 The picture of the skein looks like the yarn is two shades of gray, green, and a little bit of brown. But then, check out the socks that were made in this colourway. Where did all that blue come from? I still like it, but not quite as much as I thought I would from the original picture, so I'm not going to buy this one. The gray and green that I thought I'd be getting has a similar feel to the sock yarn I bought at Rhinebeck, anyway, so I'm finding it easier to resist now than when I first saw the colourway. Green Eyed Monster is the same. I've been coveting this one since I first saw it. It's even described as down and dirty greens, and reminiscent of Oscar the Grouch. So again, where did all the blue come from, and where has the brown gone? The picture on the website looks like Oscar, but those finished socks... not at all. I'm disappointed; if the socks had really looked like Oscar-colours I absolutely would have bought a skein, but I'm really glad I waited for some other people to knit it up so I could see what it looks like for real. I'm generally an optimistic and cheerful person, but I have a soft spot in my heart for Oscar. There's a little bit of Grouch in all of us, sometimes! Bella Coola is another one that I keep going back to look at. In the SCA I go by "Belaset," and everyone calls me "Bella" for short. (note: I had this name well before those Twilight books came out. Grr.) Given my nickname, I thought this would be an appropriate yarn for me. The picture from Blue Moon shows two blues, green, and gray. The socks that people made actually look like they came from that same skein of yarn! I'm still tempted to buy a skein of this, but I'm holding out until I knit up some more of the sock yarn I already have in my stash. I know that hand-dyed yarn can have a lot of variation from one batch to the next, but when it comes to Blue Moon, I will always check Ravelry first to see what projects have been made using a colourway before I choose to buy. The differences are sometimes so great! Their base yarn is wonderful and I love how it knits up, but I'd hate to be disappointed in a colour that just doesn't match what I thought I'd be getting. I've started a page for the Knitting Pirate over on Google+, which I greatly prefer to Facebook. If you use Google+, please feel free to add the page to your circles and spread the word! And if you still only use Facebook, don't worry - I'll keep posting links to new posts over there, too. This entry was posted on Wednesday, November 9th, 2011 at 08:50 and is filed under yarn. You can follow any responses to this entry through the RSS 2.0 feed. Both comments and pings are currently closed. Well, the blues could be coming from really crappy phone cameras. I'm constantly frustrated by how the blue pops out like a caffeinated weasal in my photos. I really love blues, but I love them in their subtle variation, and I can't show that if everything looks like I smeared cobalt blue paint all over it.